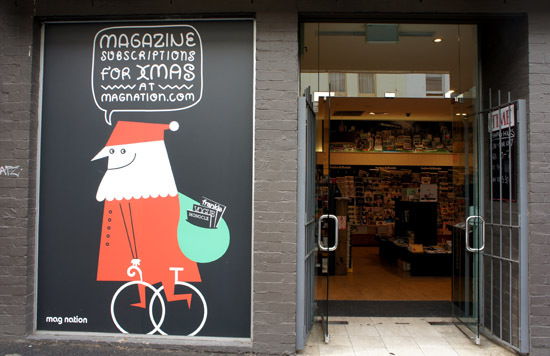 Mag Nation's Xmas window decal caught my eye. I've long been a fan of Carluccio's food store & cafe and was so pleased to secure an interview on my last trip. Emma Woodford looks after the brand, product development, buying, retail campaigns and shop displays (ooh what a fabulous job - and not one she was offering to give up either - despite my pleading!). Whilst it has been a couple of months since we chatted (and I don't have my notes on hand whilst taking a family break here in "raining raining raining, could it rain any more?" Brisbane) I concluded that everything I had assumed about the brand was indeed true. Product integrity, sourcing small artisan producers throughout Italy to make exclusive products for the Carluccio's label, respect for the relationship with suppliers, taste/flavour above all else and campaigns that celebrate the seasons is what the brand ethos was when Antonio and Patricia started the business ten years ago and it remains integral today. Emma and I also had an interesting discussion regarding time, and how interesting it would be that, if in addition to ingredient labelling, the time taken to produce artisan product was also included on packaging. Given that so much of their beautiful products are bespoke, small batch and made by hand by very small businesses it would further justify the pricing (which was not unreasonable at all according to me)... and of course the flavour. 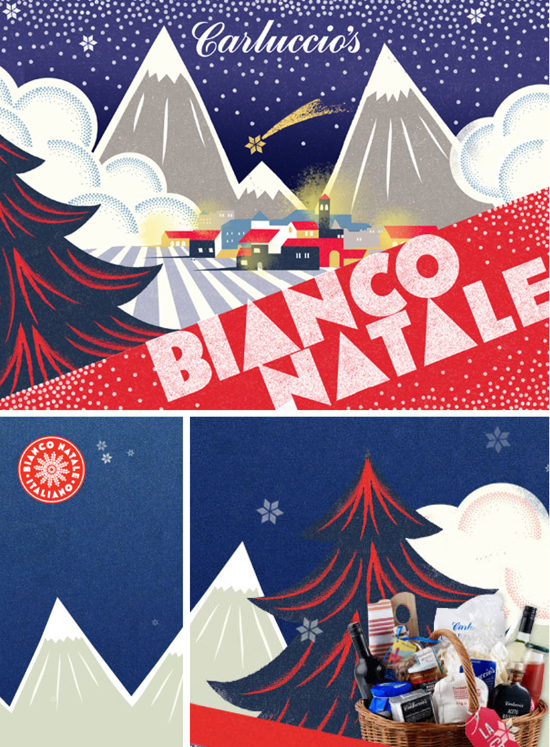 Rounding out the Carluccio's experience is their use of various artists and illustrators to produce packaging and seasonal campaigns. The Christmas 2010 printed gift catalogue was just divine (and back in October how did they know it was going to be the whitest of White Christmases in the UK?!) A big thank you to Jo Aspin who looks after Carluccio's PR for taking the time to organise this opportunity for me. Harvey Nic's food hall in it's current guise has been around for approx. 10+ years. It was fab when it first opened, and it still is. Whilst the historical, and much larger, Harrod's Food Hall just across Sloane Street is the more famous of the two and a 'must visit' particularly if you haven't 'been and seen', I love taking the express elevator to the 5th floor of Harvey Nic's for a foodie snoop then wind my way down through each floor for the latest fashion and shoe finds. The delightful Rebecca Radmore in PR could not have been more accommodating to my request for a visit and chat. Like all high-end, modern multi-channel brands, exclusive lines and first to market are the ways to a customer's heart in these competitive times. I particularly liked the 'Buyer Recommends' shelf moments that showcased new food finds and 'lifestyle' product combinations. A small outdoor terrace is used for brand experience events with valued suppliers and clients and a colourful pop up patisserie championing an up and comer on the London bakery scene was a new innovation whilst I was in town. Always good for a contemporary foodie gift to take home, the signature sepia/grey tones of the Harvey Nic's food packaging is quirky and fun, and has been from day one. My introduction to Jillian McLean's award winning venues was via the web site for The Anthologist. Words like 'culinary theatre', 'book the chefs table' and 'the perfect antidote to the city' combined with some great looking food and interiors caught my interest and it was put on my 'must visit when in London' list. I wasn't disappointed. Firstly, I love the thinking behind Jillian's company name, Morgan and Drake. Sir Francis Drake was the first Englishman to circumnavigate the globe and Captain Morgan, was a Welsh buccaneer. A pioneer of the hospitality industry, Jillian is an adventurer who set off on her own voyage in 2008 to build a group of independent, innovative bars in central London with a strong customer experience focus. Her first venue, The Refinery, opened in September 2008 in the landmark Blue Fin Building, Southwark. The Parlour in Canary Wharf followed in 2009 and The Anthologist on Gresham Street has delighted City suits since opening the doors back in April this year. This October I was so pleased to take a tour through this venue with Jillian and we talked about the latest trends in hospitality in a city that has come a long way in the food stakes in the last 10+ or so years. Research is always at the foundation of any good business and Jillian invests plenty of time travelling the East and West Coast of America, in addition to tapping into think tanks with the likes of McCann Erickson and The Future Foundation, to establish new benchmarks for customer service and dining experiences. Spend 10 minutes on the floor with her and you will see why she is the first solo woman to win a Catey Award (Caterer and Hotelkeeper's Pub & Bar Award 2010). A warm welcoming smile, hands-on attitude, and an obvious enjoyment gained from being with her staff and customers is my immediate recollection (some people just have hospitality embedded in their gene code - they live it, breathe it, love it). Wholly responsible for concept, development, launch and the running of all venues; in addition to an eclectic beverage offer Jillian places a strong emphasis on provenance and seasonal ingredients. An open kitchen, deli and chefs table combined with a wonderful selection of seating spaces to choose from depending on your mood (and of course fabulous loos), make these bar/cafe/restaurants a stand out. Venue number four, The Folly, opened last month and can be found on Gracechurch Street. I will be taking another very quick trip through London in mid-March and look forward to visiting the three other venues if time permits. In the meantime, Jillian and her team are heading to Oz in a few weeks time for some sunshine and inspiration (let's hope the torrential rains stop and the sun does finally come out for summer!). I have compiled a list of some of Melbourne and Sydney's finest drinking and dining spots for them to visit. I'd love to hear suggestions from readers too. Thank you to all POD readers from around the globe for their feedback and encouragement since launching earlier this year. I thought I'd share a couple of my favourite Duomo pictures with you this Christmas. Brisbane's cafe scene continues to channel the cool factor. A couple of lads with a passion for coffee and fixie bikes found a hole-in-the-wall garage space in Milton that once served as a bomb shelter (we're talking WW2 here). Convinced it would be the perfect location for a coffee machine and caffeine hit, after a lot of 'red tape', Bunker arrived back in August. Serving a Fair Trade organic blend from local roaster, Blackstar, I can't wait to get back to Brissy for the festive season and see what else is worth a snoop on the bean scene. Pics via Studio Sixty. 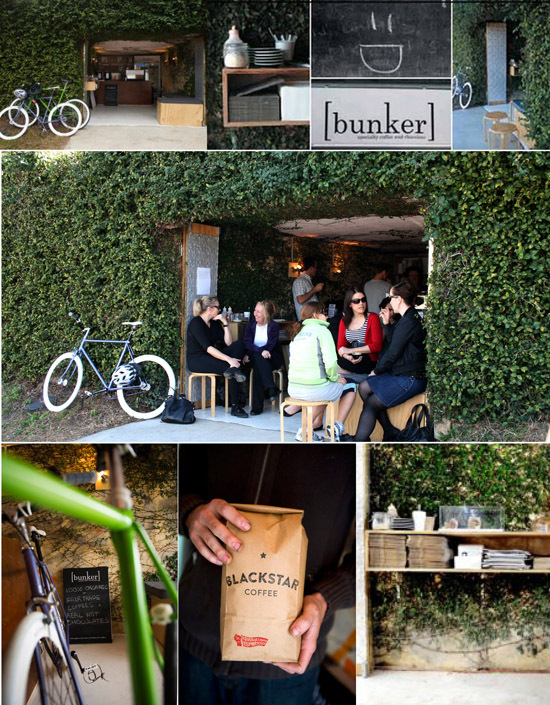 Bunker, 21 Railway Terrace, Milton, Brisbane. I spotted this new brand, and brand new store, at Chadstone this week. Mim Design has delivered a striking look for the BadAss lifestyle label. Designed in Australia, the range includes all sorts of carry bags and accessories for the electronic gadgets we can't seem to live without these days. The smiling face belongs to super sales girl, Kitty... I can only say her enthusiasm is a rare find in retail land these days! Sussan's flagship store at Chadstone continues to lead the way with terrific merchandising tales. Fun windows featuring a motorised gingerbread man can be found in Peter Alexander stores this festive season. Norwegian born Amy Hunting studied furniture design in Denmark then moved to London and opened her own studio. 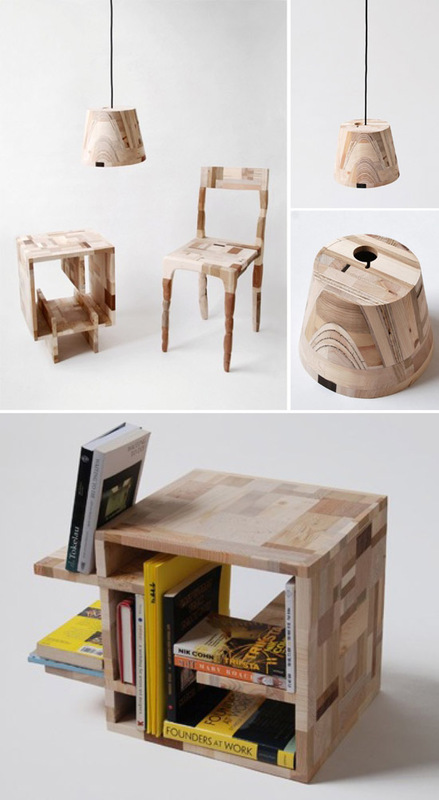 Amy has gathered waste wood from various factories in Denmark and turned it into fab furniture. Made entirely out of wood the collection consist of a chair, a book box and 12 lamps that fit inside each other like babooshka dolls. All the pieces are hand made. Sustainable and striking don't you think?